Today I am participating in a Green Books campaign. I've stated my personal opinion about "being green" or "going green" before. I believe that we are to be good stewards of the world God made for us and we should take control over the things we have direct authority over. I'm not here to tell you how to be green and I don't expect anyone else to be telling me how to be green. I think it is a personal decision that each individual family must make for themselves. For our part, we like talking about how God created the world (Gen. 1:1) and then gave the instruction for the man and woman to take dominion of it. We seek to do just that by caring for the things that we have control over. 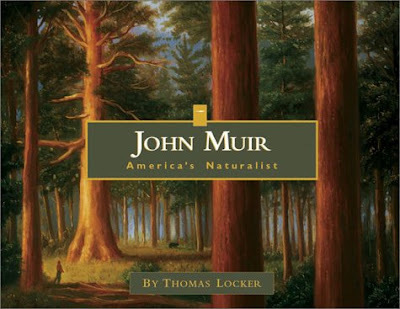 Recently, I was given an opportunity to review the book John Muir: America's Naturalist (published by Fulcrum Publishing). This book is illustrated by Thomas Locker, who also illustrated Rip Van Winkle (which I reviewed over at 5 Minutes for Books). His artwork is breathtaking. His paintings are masterpieces and I love just looking through his books - neverminding the words on teh page! Locker is a very gifted artist and it makes his books a delight. Before reading this book on Muir , I really didn't know very much about him. I had heard the name before but I couldn't have told you who he was or what he did. Born in Scotland in 1838, Muir came to America with his family at age eleven. His father worked a farm in Wisconsin and tried to teach John that "nature was God's gift to man to use as a resource." John listened to his father (who I happen to agree with) but developed some of his own views of nature (which I also agree with). John found beauty in the world and was active in trying to preserve it. He founded the Sierra Club and worked with President Teddy Roosevelt to establish a national park system. Heralded as a great environmentalist, these claims are very true to a certain extent. I don't agree with all of his philosophies and outlook but one thing I can agree with is his love of beauty and desire to protect and keep it. His work went on to inspire the likes of Ansel Adams. Muir also associated with Gifford Pinchot, the first head of a U.S. Forest Service. Pinchot believed in the sustainable use of natural resources for the benefit of people which is something I can totally agree with. Again, I may not agree with all of Muir's philosophies but I do agree with what he was trying to do and I think this book presents a very balanced view of Muir and his ideals. I found it to be a very even keeled book that presents the basics of who Muir was and what he believed. Thomas Locker helps to express all of the points Muir was trying to make with this lovely illustrations and I think this book is a huge asset to children learning about how to take better care of the earth God created. I rather recommend this one. ** This post was originally published as a giveaway but the contest is now closed. I would love a copy! I have not been to Yosemite yet but I grew up hearing my mom and dad tell me about it's beauty and we are hoping to make a camping trip there soon. I like the balance between stewardship and guardianship, I believe we must take care of the natural earth and it's creatures but I also believe that we are to make use of the many resources made available to us. So that's how the Sierra Club was started. Good to know. What a neat book! 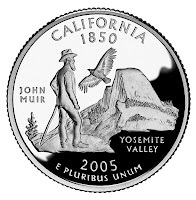 I'm a fan of Muir and his campaign to establish the Yosemite National Park--and I'm pretty familiar with him, but probably because I live near Yosemite. :) I'd love to win a copy of this book! I would love to win a copy for my husband. Muir Woods is his favorite place. Thank you for this giveaway. We recently watched the National Parks series on PBS. We as a nation are lucky that individuals such as John Muir had the foresight to fight for the land they loved. We'd love to read the book, especially since we are Wisconsinites ourselves, growin up in the area where John Muir spent his formulative years. My mom grew up near Yosemite and I have heard about it my whole life but never been. I would love this book! Thanks. I would love to get a copy of this book. Thanks for hosting the giveaway! I subscribe to your blog via RSS. Does that count for a second entry? That looks lovely! Please count me in. This looks like a wonderful addition to a homeschool library! Please enter me. I would love to win the John Muir book. My husband and I just returned from Yosemite and Death Valley. Everything should be done to protect our National Parks. I'd love a shot. Thanks for the giveaway. I would love a copy of this book- thanks for the giveaway. The cover's colors are so deep...so real. Complete side note: introduced my girls to Betsy and Tacy through the audio book each night at bedtime. We love them! I remember reading the first book as a child(still have it). So fun to here others are fans as well- so fun to share this with my own daughters! The cover is beautiful. Makes me want to see the illustrations inside. John Muir is an interesting fellow. I highly recommend his (sort of) children's book, Stickeen. I gave my brother a photo of John Muir and Teddy Roosevelt taken in Yosemite. It is on the wall by his desk. And I would be grateful if you would put my name in on the drawing. THank you. What a cool book! John Muir and the establishment of our parks sounds interesting. Please enter me as I would love to have this book in my home. I don't want to win the book, just want to leave a comment. I love Locker's art and have been interested in learning about Muir, so this sounds like a good jumping off place. I hear Muir's journals/writings are wonderful. I saw this on Amazon and was intrigued. It looks like a beautiful book. I would love to win a copy. I would like to win this book! Thanks for the chance. My husband and I have been to several national parks and have heard much about Muir. Would love to be included in this giveaway. Oh this book looks beautiful. Would love to win it, read it and pass it on to a family member who would also love it. I just signed up to follow your site on google reader. It looks great.